Chimp intelligence levels show same markers as humans – FIREPAW, Inc. While there has been plenty written about humans lacking both these days, the scientific arena still holds that the ability to use self-control and delay gratification are markers of human intelligence. 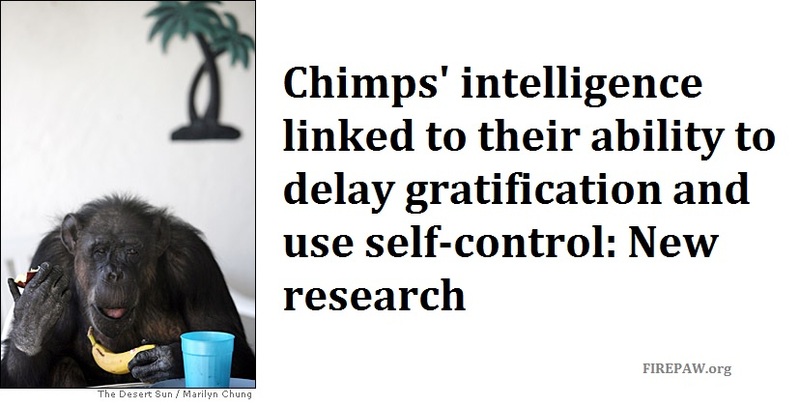 Now, researchers have discovered that the same is true for chimpanzees, with both self-control and gratification delay being correlated with their overall intelligence. We can only hope that chimps continue to steer clear of smartphones. As is true in humans, chimpanzees’ general intelligence is correlated to their ability to exert self-control and delay gratification, according to new research. The research finding relates back to the famous “marshmallow test,” an experiment originally performed at Stanford University in the 1960s. In the test, children are given the choice of taking a small, immediate reward (a single marshmallow placed in front of them) or waiting to earn a larger reward (two marshmallows). Previous research has found that children who perform well on the marshmallow test and other tests of delayed gratification tend to also perform well on tests of general intelligence. The study, published in Current Biology, chimpanzees performed the Hybrid Delay Task, which tracks how often chimpanzees choose to wait for a larger, better reward rather than taking a smaller reward right away. It also measures how well the chimpanzees managed to wait during the delay period, when there is a constant temptation to capitulate and accept the smaller reward. The chimpanzees then completed the Primate Cognitive Test Battery, a test of general intelligence that measures a variety of individual social and cognitive factors, such as the capacity to follow pointing gestures. Those chimpanzees who showed the highest levels of generalized intelligence were also the most efficient in the delayed gratification test. Intelligence scores were related not only to how often chimpanzees chose to try to wait for the better reward, but also to how well the chimpanzees could wait when they chose to do so. This was the first such study to examine the relation between general intelligence scores and delayed gratification abilities in chimpanzees.